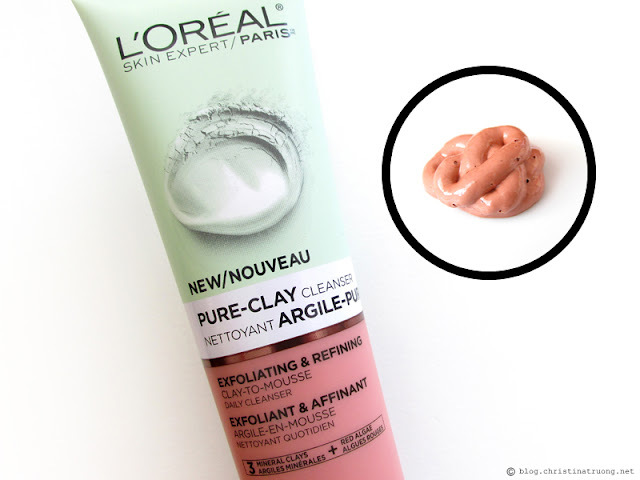 L'Oreal Skin Expert's 1st range of clay-to-mousse daily cleansers enhances with a nature-sourced ingredient leaving skin feeling fresh and clean. This cleanser is enriched with 3 mineral clays (Kaolin, Montmorillonite, and Moroccan) and Red Algae Extract. 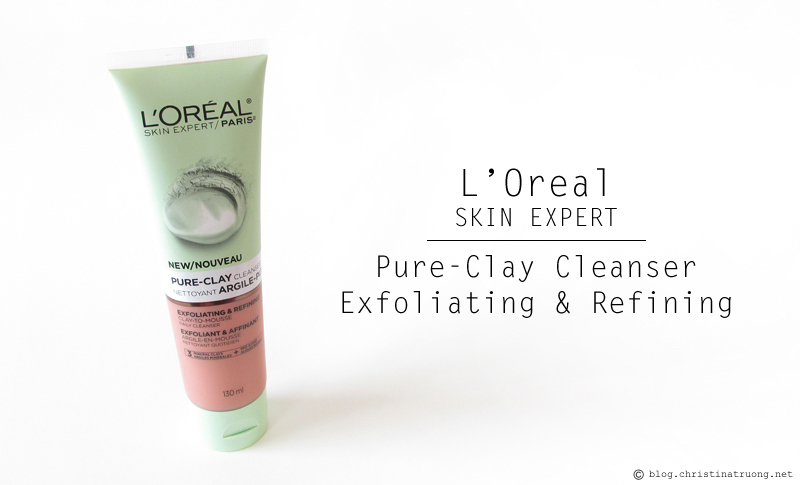 Pure-Clay Cleanser Exfoliating & Refining leaves skin with pores looking tighter, and less visible, without overdrying. Immediate results include skin being purified of dirt, oil and pollution allowing skin to feel clean, fresh and smooth. After 1 week of use, pores will look minimized for refined skin texture and improves skin's overall appearance. First impression, the product definitely comes out a clay texture and when water is added it does provide a mousse-like consistency. The product has a mild citrus fragrance, it's not an overwhelming scent and does not linger for long. It's either a scent you'll love or eventually get use to. Now onto the actual product effectiveness. The cleanser did clean my face and left it feeling smooth and purified. Once the product massages into the skin, it almost turns into a light foam. The micro-beads that exfoliate the skin feels very gentle and does not irritate the skin at all. It rinses off easily but does make the skin looking a bit red, but worry not, it does not stain your sink, a quick rinse around and it will go down the drain. Afterwards I pat my skin dry and continue with the rest of my skincare routine. Overall, I like using this cleanser as a second cleanser, I wouldn't use it to remove makeup. My pores minimized but I didn't notice a huge difference in terms of overall appearance. But at the end of the day, I loved how clean and smooth my face would feel. I would recommend this product for those who have combination-to-oily skin. I wouldn't recommend this to someone who has dry skin as this product exfoliates and it will most likely cause the skin to be more dry. Disclaimer: Product received complimentary for review purposes. Views expressed are honest and of my own.